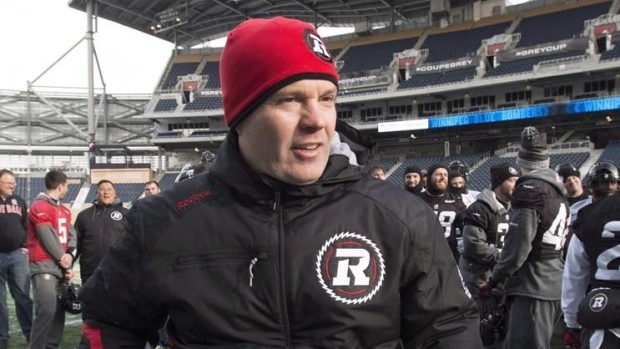 Ottawa Redblacks head coach Rick Campbell and his entire coaching staff will return next season after guiding the CFL club to victory in the 2016 Grey Cup in Toronto. Campbell will return for a fourth year at the helm. He has helped the Redblacks make back-to-back appearances in the championship game. Ottawa defeated the Calgary Stampeders 39-33 in overtime last month at BMO Field. "It's exciting to have our entire coaching staff back for 2017, " Campbell said in a release. "Their hard work and dedication played a huge role in us winning the 2016 Grey Cup. This continuity allows us to continue to grow and build a winning team for 2017." Campbell's staff includes offensive co-ordinator Jaime Elizondo, defensive co-ordinator Mark Nelson, special teams co-ordinator Bob Dyce, offensive line coach Bryan Chiu, defensive line coach Leroy Blugh, receivers coach Travis Moore, defensive backs coach Ike Charlton, linebackers coach Derek Oswalt, offensive assistant Beau Walker and coaching assistant Patrick Bourgon.